Rochester’s winter weather can pose significant risks to parking lot structures. From ice build up to fall hazards to snowed-in vehicles, it is important that businesses and landlords understand these crucial risks and the best practices for minimizing them. Many businesses use road salt as a way to melt the ice and provide traction during the winter. However, you should not use road salt in parking lot structures. Not only can road salt cause irreparable corrosion and damage to vehicles, the material can also corrode the parking structure’s concrete. Experts suggest that you minimize deicing materials as much as possible, and instead scape and plow ice and snow by hand. Opt for sand or a chemical deicer instead, such as calcium magnesium acetate (CMA). It’s important to prepare the parking structure before the winter. Check for any cracks, deterioration, or defects where water can penetrate and cause damage to concrete. Caulk these areas to avoid further damage. Make sure to clean the roof and gutters prior to winter as well, as debris can cause damage during the melting period. Clearly mark expansion joints to avoid impact while plowing. When driving a snowplow over slopes, make sure to reduce your speed. Do not push snow or the snowplow into walls, deck surfaces, and other places that could cause significant impact. Do not store snow over floor drains. Always make sure to remove frozen snow, ice, and hanging icicles each day. Always plan your removal processes before you start plowing. 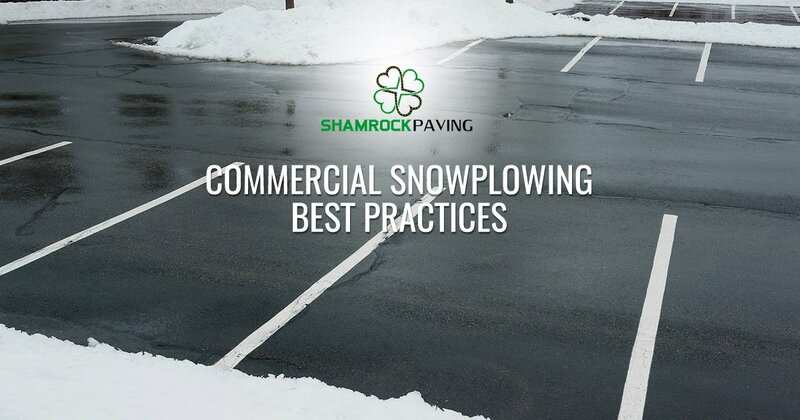 Does your parking lot structure need additional maintenance after a snowstorm? Contact Shamrock Paving today. We are proud to serve commercial and residential buildings throughout the Rochester area.